35% of phones are lost or stolen each year, according to Asurion claims data, and that number jumps to 50% if you have an iPhone. Be smart about the information you put on your cellphone, as it could easily end up in the hands of a criminal. Almost every bank has an app, making it easy to cash checks, transfer money and check your balance on the go, something 40% of Americans say they do. But if that information ever ends up in the hands of a thief, you’ll be out more than just your phone. You can prevent that by disabling the auto-sign feature on your banking app. Having to manually enter a password to access your financial information will prevent thieves from accessing your sensitive data so easily while maintaining the convenience of mobile banking. Things like your social security number, driver’s license information, passport number or credit card information simply do not belong on your cellphone- there’s just not a strong protection solution to ensure that information is safe. If your phone ever lands in the wrong hands, thieves have an open invitation to access very sensitive personal information. Protect yourself by keeping it in a safe place, not on your cellphone. 62% of Americans use their phones to send/receive emails, and over 50% access social media sites from their mobile device. These platforms are often automatically synced with your phone so you don’t have to enter login information each time. With this function turned on, it’s incredibly easy for a thief to gain access to your online shopping profiles, banking information and social media accounts. From there, it just takes a few clicks to drain your bank account on an unwanted eBay shopping spree or spam your friends with junk mail! 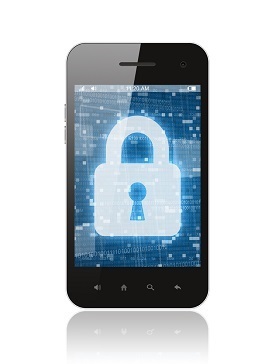 Avoid storing passwords and important numbers on your phone. Things like alarm codes, bank pin numbers, email or social media passwords and online shopping information should never be saved on your phone. There’s just not a protection solution available strong enough to keep it all safe. Play it safe, and don’t keep this kind of information on your cellphone.